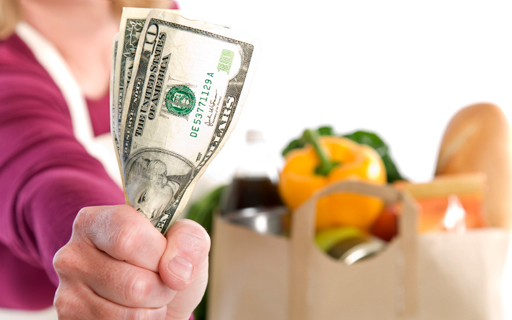 tips for saving money on healthy nutrition! This crucial tip goes along with the first one of learning to read nutritional labels on foods. This book is an excellent guide to improving your health and nutrition so you are already ahead of the game. That being said, the more legitimate research you do on health and nutrition the better off you will be. Some foods and beverages don’t have nutritional labels. Some products have false or exaggerated advertising and claims listed on them that you shouldn’t believe. Also, new research is always being done in the field of nutrition and you need to stay current or risk making less intelligent decisions on what you eat. Purchasing and reading this book is a fantastic start to your nutrition education but this new field continues to grow and there is always more to learn. Avoid learning your nutrition information from companies that are simply advertising their products or unnatural bodybuilders that have achieved their physiques through illegal drugs. Some reputable sources for you to look into include WebMD, The American Heart Association, The American College of Sports Medicine, and dozens of other academic journals. You may think clipping coupons is a waste of time, but if you spend a few minutes a week on it the savings will add up! Checking out your grocery store’s flyers also help to find the daily, weekly, or seasonal specials. Signing up for your vendor’s email newsletter or promotions may also provide access to plenty of coupons and savings. Another great method now is signing up for your store’s rewards account where they scan your card on every checkout. This will end up getting you plenty of savings throughout the store and often some additional rewards and cashback. The store gets to know what kind of products you prefer so it can stock up and you get save money. That sounds like a win-win situation to me. Sometimes you can get lucky and the food item that you are looking for is on clearance. This can be for several reasons like the store is overstocked, the packaging is dented, or the item is going to expire in the next month or so. As long as the quality of the item is not in question, I’d say go for it! I once bought a box of cereal that was normally $4 for $1 because the cereal box was dented. The bag on the inside was still sealed and the cereal wasn’t crushed so I bought it for just a quarter of the regular price. Items like that are constantly falling off shelves, being mishandled, or dropped and this can be your ticket to extra savings. There may be a clearance isle or section in your local grocery store and you can ask the manager or a store clerk where it is. This trick works whether you are afraid of over-eating, overspending, or both. Before you go out or face the meal in question, make sure to drink about 16 oz of water beforehand so that you are filled up and your appetite is naturally decreased. You can also fill yourself up with other healthy and low calorie options such as vegetables, whole grains, a whey protein shake, coffee, tea, or other zero calorie beverage. This is an excellent tactic to use before going out to eat, out to a party, or going shopping at the grocery store. Drinking water or eating healthy food is also a much healthier and more natural alternative than taking some of the questionable and expensive appetite suppressant supplements that are out there. Not to mention drinking water is free! This strategy really only works with small store or restaurant owners that have the flexibility to make individual deals if they see fit. This obviously won’t work at big box stores and huge chains unless you are a master negotiator. They say that everything is negotiable and food is no exception. Things that may be negotiable include items that the store is overstocked with, food that is slow to sell, freshly made breads or bagels that are a day old, or products that are getting somewhat close to their expiration date. You may be able to negotiate discounts on a large volume order or a cash deal as well. The best place to practice this is at your city or town’s local food market. Learning to haggle will help not only help you save money on your food bill and it’s always a good skill to have. Do you think only professional athletes get sponsored by food companies, supplement companies, or restaurants? Think again. While you may not be able to finagle a six figure deal with Gatorade, it is definitely possible for sponsorships or partnerships to be created. If you are a member of a local sports team, look into making a deal with a local healthy restaurant. Ask them to provide healthy post-game food in exchange for free publicity or a spot on your uniforms. If you are involved with a church or charitable organization, many supermarkets or restaurants would be happy to help contribute to the cause in one way or another. One of those ways may be providing healthy and nutritious products to those running the charity and those receiving the charitable donations. It can be a win-win situation for everybody involved. There are many other deals and relationships that can create free or discounted nutrition to you and others. It may just might take a little work and persistence to get started but eventually it will pay off big time. While it may not be possible for every person or organization to get a sponsorship, you never know until you try and it never hurts to ask. Sometimes getting food products or nutritional supplements simply requires a trade of services. I know many people that have provided their trade or expertise in exchange for the products of a store, restaurant, or supplement company owner. I’ve provided personal training on occasion for nutritional supplements, as long as the exchange is worthwhile to both parties. Perhaps the store, restaurant, or company owner needs the services you provide but normally couldn’t afford them. They purchase or cook their products at wholesale prices and provide them to you in exchange for your product or service and everybody wins. It’s not rocket science and in many situations it can be the smartest move. You may even get referrals for your quality products or services, increase your income, and then have even more money to invest in your health and fitness!